The exact origins, as well as the purpose of the “Trout in the Box (of Spam)” is unknown, but scholars and housewives have developed the theory that it has something to do with an ancient Phoenician fisherman and his desire to amuse local villagers, young and old, with a new kind of toy. The fisherman’s intent was to collaborate with a local watchmaker who had a penchant for puzzles and games, as well as an obvious talent for gizmos and gadgets, but the watchmaker fell ill and therefore could not participate in the project. The fisherman was good at getting things down on paper, but he lacked engineering skills. When the butcher heard of his plight, he volunteered to help. His special talent was to slap, whack and hack meat, but he also had a fondness for explosive devices, the color pink, and things that go “pop”. 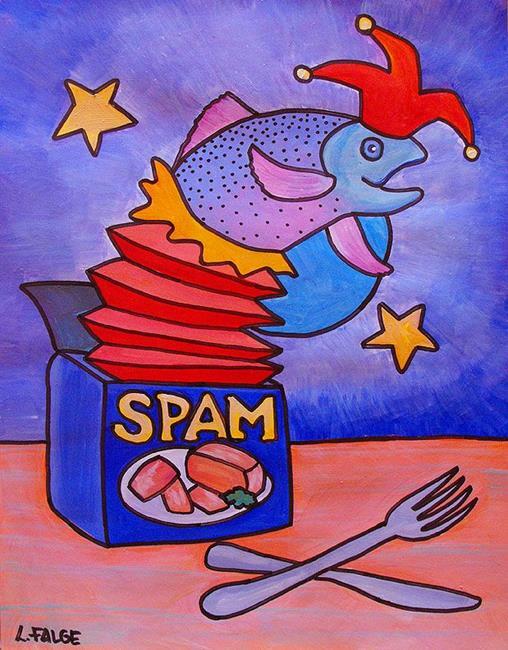 In a matter of days, the “Trout in the Box (of Spam)” was born… a result of the butcher’s interpretation and execution of the fisherman’s proprietary idea. The way it works is thus: one simply cranks the handle on the back of the metal box and the tune “Cry Me a River” is produced. This goes on until a sense of complacency is achieved, then all at once, out pops the trout, along with a loud slapping noise and a leering grin on his face. Amusing? Ah, yes, excruciatingly so.